Sorry, we couldn't find that suburb - make sure the spelling is correct or try calling our office on 3273 4133. If you’re planning a big clean-up around the house and garden and there’s plenty of rubbish you need to dispose of, your normal household bin probably won’t be big enough to store all that waste. Make the cleaning process a whole lot simpler and easier by hiring a skip bin in Brisbane through Cheapa Skips. We provide a hassle-free and cheap skip bins Brisbane hire service where you can place your order online, choose from a range of skip bin sizes and have your skip bin delivered on a day that suits you. Enter your postcode into our online form to receive an instant quote. If you’re happy with the price, simply book and pay online. We also take bookings over the phone on 3273 4133. Hiring a skip bin through Cheapa Skips couldn’t be easier with our simple 6 step guide. You don’t even have to step out of your house to place a skip bin order. The whole skip bin hire process can be completed through our website where you can choose the bin size you’re after as well as your delivery and collection date. Hiring a skip bin is so simple, thanks to our easy to use online quote and booking process. You can also place a booking over the phone. You can trust that we will turn up with the skip bin you require on the day you’ve booked. Our customers vouch for our reliability. Read our testimonials to see for yourself. We offer our service with a smile, always going out of our way to make the skip bin hire process a pleasant experience for you. If you have any questions about our skip bin hire service, we’re more than happy to answer them, and once you’ve made a booking, we will always keep you informed. We stand by our promise to provide cheap skip bins Brisbane wide with affordable prices that rivals our competition. Just because we’re affordable, that doesn’t mean you need to compromise on service. We are always professional and deliver our service to a high standard. We’ve been in the rubbish removal business for over 20 years. With unrivalled knowledge about the rubbish removal industry, Cheapa Skips is your best choice. When ordering a skip bin, it’s important to specify the type of waste you have and the size of bin you need so we can provide you with an accurate quote. If you plan on hiring a skip bin that is larger than five cubic meters in size, please call us on 3273 4133 to check availability. Can’t see skip bins on our website that are available on the days you require? Give us a call instead, and we’ll see what we can do for you. Once you’ve placed your skip bin order with us, one of our trucks will turn up to your property on the day you booked and place the skip bin in a suitable location on your property. It’s always important to put your skip bin in a place that is easily accessible for you during your clean up process, while also not restricting access for yourself or interfering with the public. My first experience hiring a skip bin was excellent and seamless. From my first conversation to ordering and the delivery and pickup of the skip bin, the Cheapa Skips team were really friendly and efficient. I called a few different bin companies and Cheapa Skips not only had the best price but they took the time to explain my options & the pricing to me. I would recommend these guys to anyone. 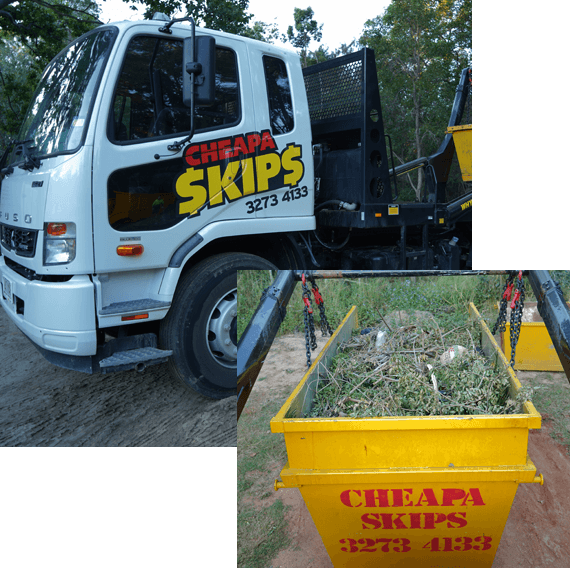 Whether this is your first time hiring a skip bin or if you’ve hired a skip bin before, at Cheapa Skip bins we go above and beyond to provide hassle free skip bin hire in Brisbane, making it easy for anyone to book a skip bin for a cheap price. Want to learn more about hiring our cheap skip bins Brisbane wide? Call us on 3273 4133 or send us an email at cheapaskipsqld@gmail.com.